Earlier on Monday we featured a post originally penned for CNBC, suggesting shares of search engine giant Alphabet (GOOGL) were too overbought/overextended to make for a safe bet. As Newton Advisors' Mark Newton explained it, after the big runup that began immediately after the Christmas break, "It's likely the stock stalls out and starts to pull back a bit." The concern is certainly understandable. FANG stocks are inherently volatile, which is what traders love about them. And, Alphabet has been an unusually bullish name for the past six weeks. We're going to move to the other side of the table though, and suggest that of all the FANG names, Alphabet shares are best positioned for more upside going forward. 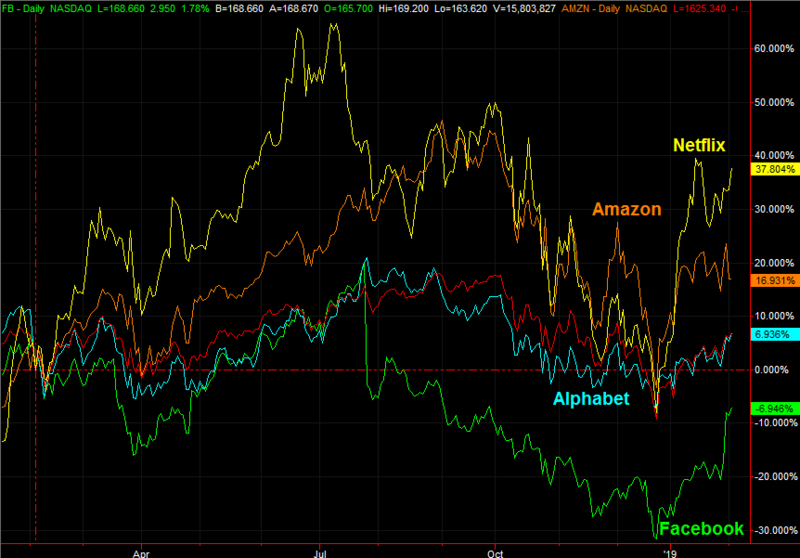 But, first things first... a look at how each FANG name - Facebook, Amazon, Netflix and Google (now Alphabet) - are faring compared to one another over the course of the past year. The performance comparison puts things in perspective, but it doesn't tell the whole story. 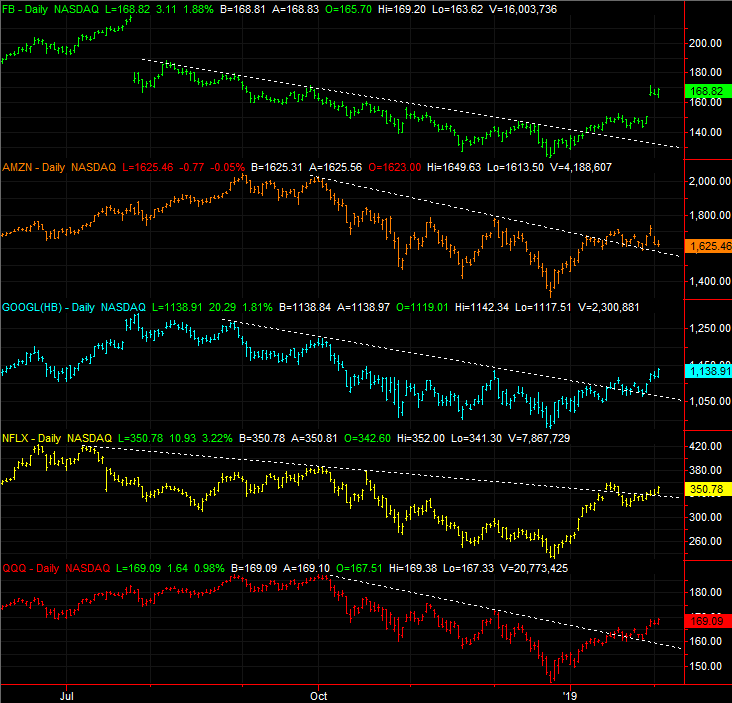 Adding to the analysis is a look at the daily chart of each of these four stocks plus the comparative QQQ. It's on this chart we can see the only FANG name that's cleanly cleared the falling resistance lines faced late last year is GOOGL. Facebook has left behind a bullish gap, Amazon is starting to slip again, and as impressive as Netflix's long-term gain has been, it's suspiciously been unable to remain above its early January peak. Alphabet's uptrend, as suggested by its shape, is the only one that looks healthy enough to step into. Bolstering the bullish argument is that as of Monday, GOOGL stock has not only broken above its 200-day moving average line, but logged a high above its early December peak of $1135... when that same 200-day moving average line (white) stopped and reversed the then-budding rally. Further underscoring the bullish argument is how the amount of bullish volume pouring in continues to rise. Underscoring it even more is that, albeit loosely, the action since October is starting to look like an upside-down head and shoulders pattern. If it completes (and it may already be wrapping it up), the next move should be a surprisingly good-sized advance. Also take note of the way GOOGL shares found support at the 50-day moving average line (purple) a couple of times last month. None of this is to imply Newton's worry is misguided. His plan to "hold off and wait to buy under $1,050 as opposed to chasing it here" has its obvious merits. 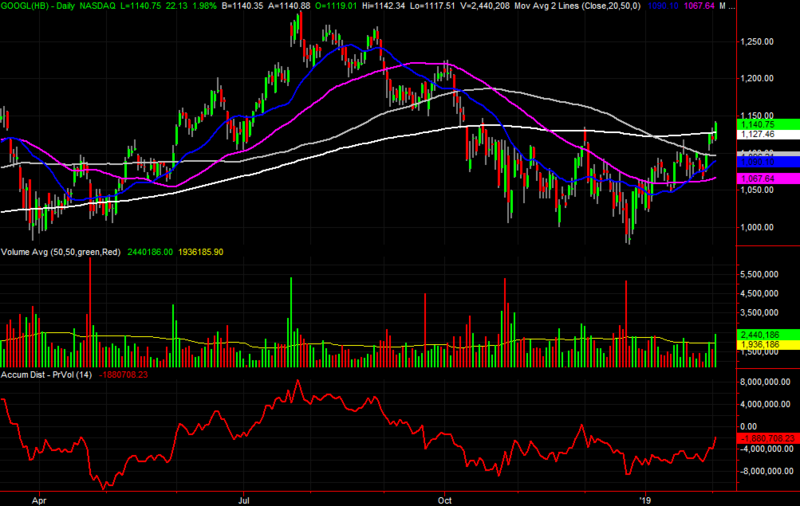 But, given the situation, a trader may not get such an opportunity. Even with Thursday's small gap, traders appear more than ready to make good on the rally's promise that was only hinted at a couple of weeks ago. Of the four FANG stocks, this one's actually the healthiest possibility of all. If you'd like to do more with this information, like turning it into actionable trading ideas on a regular basis, our FANG Options Trader Advisory Service. This newsletter specializes in identifying the nuances of each FANG name, and pinpointing the options best-suited to capitalize on budding trends. Although only four names, there's more than enough 'action' in these four well-watched names to give you plenty of trading opportunities. The FANG Options Trader Advisory Service issues about eight trade alerts per month, targeting holding periods of only a few days, but target gains of 100% or more. Go here to learn more about this amazing trading service.